NEW YORK – Paula Cooper Gallery is pleased to present an exhibition of work by Mark di Suvero. Throughout his sixty-year career, di Suvero has created vibrant and dynamic works, which fuse vitality and movement with complex construction. Presenting a range of medium including sculpture, painting, and drawing, this new exhibition explores the artist’s expanded use of gestural curvature and nonlinearity. The show will be on view at 534 West 21st Street from January 6th through February 3rd, 2018. The opening reception will be on Saturday, January 6th from 6 to 8pm. For his monumental work, Eppur si muove (2014-2017), di Suvero cuts a massive flat plate of stainless steel into an undulating Möbius band that he coils and twists to envelop a horizontal cylinder. Elevated by white support beams on either end, the torqued steel appears like an enormous spiral streamer, buoyant and effervescent in its refractive lustered surface. “And yet it moves,” as the title, a quote by Galileo, denotes: the kinetic sculpture calls on the viewer to participate actively—to walk under and around, to observe its oscillating, pendulous mass. “Participation inside a piece, where you don’t just stay as a static external observer but actually enter and change the piece itself; I think that is central to the work that I’m trying to do,” di Suvero stated in North Star, the 1978 documentary film about his work. “It allows the possibility of people to enjoy.” A second sculpture, Acla Cuna (1994), revolves on a vertical axis, its osseous curvature cutting through space. Di Suvero’s paintings, Ergo (2016) and Untitled (2017), push color contrasts to rich and energetic extremes. Varied painterly marks are applied rhythmically across their surfaces; gestural patterns bleed and intersect. Rendered in part using phosphorescent paint, di Suvero inserts literal luminescence such that, when viewed under black light, the works reveal alternate subconscious meanings. Also on view are a number of sliding paper works, for which di Suvero splices one drawing of ink, marker and pen through another. Inviting the viewer to shift their center panels, the works’ compositions are transformed as their abstract lines caper within the frames. Similarly contingent and mutable are a group of small-scale sculpture composed of loosely interlocking parts. Challenging the viewer’s creative ingenuity, these works can be repositioned to form countless configurations of varying volume and stability. Born 1933, Mark di Suvero first came to public prominence in 1975 with a display of his work in the Jardin des Tuileries in Paris—the first for any living artist—and a major retrospective that same year at the Whitney Museum of American Art in New York, which featured his large-scale sculpture in public sites through all five boroughs of the city. The artist has had acclaimed international exhibitions in Nice (1991), Venice (1995, on the occasion of the 46th Venice Biennale) and Paris (1997), among others. In 2011, eleven monumental works were installed on Governors Island in New York Harbor. Organized by Storm King Art Center, this marked the largest outdoor exhibition of work in New York City since the 1970s. That same year di Suvero received the National Medal of Arts, the nation’s highest honor given to artists. In May 2013, the San Francisco Museum of Modern Art presented eight monumental sculptures in the city’s historic Crissy Field for a yearlong outdoor exhibition. In September 2016, two monumental works were installed on Chicago’s Lakeshore Drive through a partnership between the Chicago Park District and EXPO CHICAGO; they will remain on view through September 2018. One can also see a number of di Suvero sculptures at the Storm King Art Center in Mountainville, New York, permanently installed. The artist currently lives and works in New York. Ranging from approximately five to thirteen feet in height, the midsize scale of the works on view accommodates an especially wide range of formal improvisation that highlights the artist’s constructivist foundation and expansive manipulation of line and space. Composed of texturally contrasting materials including stainless steel, painted steel, steel and wood, Nextro (2003) offers an enigmatic staccato of linear and spherical elements. A recent work from 2015 entitled Post-Matisse Pullout draws inspiration from the cut-outs of the French artist, Henri Matisse. The playful potential for imminent change contained in its bowing curvilinear structure recalls the mutable paper and thumbtacks used by Matisse for continuous alterations. In contrast to that work’s lithe unbroken lines, The Cave (2015) and Szymborska (2016) deliver multifaceted planes, sharp angles, interlocking chains and robust load-bearing steel beams. Also on view are calligraphic ink drawings and vibrantly colored acrylic paintings. Collection of the artist. Photograph ©George Bellamy. This fall the KMA will host two of internationally renowned artist Mark di Suvero’s pioneering steel sculptures. Since the 1950s, di Suvero has transformed industrial materials such as wood timbers, tires, and scrap metal to create works that dynamize their setting. Visitors will find the space of the KMA’s South Lawn activated with Yoga (1991) and the Marilyn M. Simpson Sculpture Garden with Rust Angel (1995), works that exemplify di Suvero’s ability to imbue familiar sites with an original energy. This project is supported by the Robert Rauschenberg Foundation in honor of Charles Bergman’s many years of counsel and service. Additional Support for this exhibition is provided by Jon & Nancy Bauer, Victoria & Stephen Morris, the Donna & Marvin Schwartz Foundation, the Silverweed Foundation, and the Ohnell Family Foundation. Special thanks to Elizabeth & Samuel Sachs for their support and collaboration. IN/SITU Outside provides the opportunity for EXPO CHICAGO Exhibitors to present temporary public art installations situated along the Lakefront and throughout Chicago neighborhoods, presented in partnership with the Chicago Park District (CPD) and Department of Cultural Affairs and Special Events (DCASE). Past curators include Louis Grachos (2015 | Dr. and Mrs. Ernest C. Butler Executive Director of The Contemporary Austin), Renaud Proch (2014 | Executive Director, Independent Curators International), Shamim M. Momin (2013 | Los Angeles Nomadic Division), and Michael Ned Holte (2012 | writer and independent curator). Berggruen Gallery is pleased to present an exhibition of selected works on view at 228 Grant Avenue opening Tuesday, July 5th. 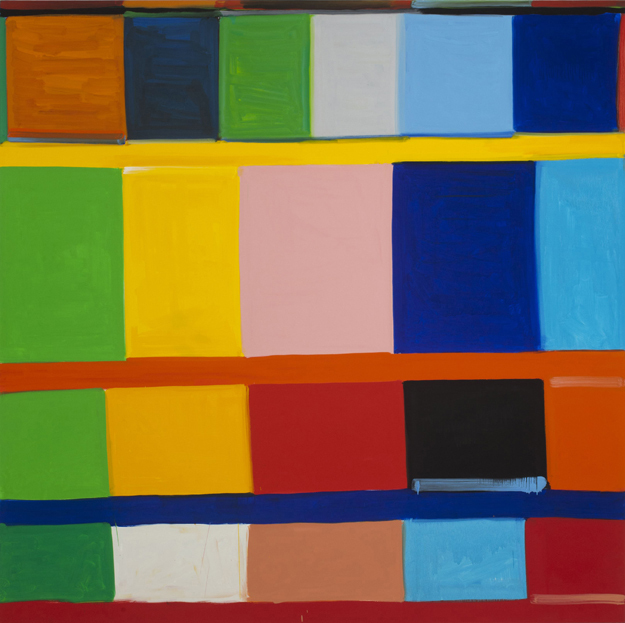 The exhibition will feature works by Willem de Kooning, Mark di Suvero, Richard Diebenkorn, Liza Lou, Bridget Riley, Sean Scully, and Stanley Whitney. Please note that we will be closing our location at 228 Grant Avenue on July 31 and will be re-opening at 10 Hawthorne Street in mid-October. From August to October, we will be available by appointment. We look forward to continuing to share updates with you as we approach our opening at Hawthorne. New York-based artist Mark di Suvero speaks about his life and art—from being a founding member of the Park Place Gallery in New York in 1963 to his work Joie de Vivre, 1998, which is located in Zuccotti Park—as well as the 30th anniversary of the outdoor museum Socrates Sculpture Park, which he founded in 1986 on an abandoned landfill and illegal dumpsite in Long Island City, New York. Beginning Sunday, May 8, the institution presents “LANDMARK,” a series of artist commissions and projects, on view through August 28, 2016. Close Readings: American Abstract Art from the Vanderbilt University Fine Arts Gallery is being presented in recognition of a recent gifts of contemporary art from the collections of Sarah-Ann and Werner Kramarsky and of Edna and Monroe Kornfeld. Drawing on these new gifts, as well as Vanderbilt’s own collection, Close Readings will feature a wide range of abstract art by some of America’s most prominent artists, including Josef Albers, William Anastasi, Ross Bleckner, Stuart Davis, Sam Durant, Sam Gilliam, Cheryl Goldsleger, Lee Krasner, Robert Motherwell, Harvey Quaytman, Martin Puryear, and Mark di Suvero. Close Readings shifts away from the traditional exhibition with its singular “voice” of the curator in that forty departments and centers across Vanderbilt have been invited to respond to one of the many works of abstract art that will be shown, each providing a personal “close reading” from the perspective of a specific discipline. Faculty and students alike have submitted their writing, providing new, fresh insights into how we look at art. All of the responses are collected on a companion blog, with a selection featured in the exhibition, rotating over the course of its run. This exhibition is supported by a generous gift from the Terra Foundation for American Art on behalf of board member Greg Williamson, with additional support provided by the Ewers Gift for Fine Art. It is organized by the Vanderbilt University Fine Arts Gallery and curated by Joseph S. Mella, director. In collaboration with the Blair School of Music, a concert will be held on Tuesday, March 29 from 7 to 8:30pm in the Gallery with a reception to follow. Composers Michael Alec Rose, Michael Slayton, and two of their students have responded to works within the exhibition by Robert Motherwell, William Wylie, Sam Gilliam, and Conrad Marca-Relli with four new compositions. The pieces vary in length from three to five minutes and will be performed by Blair students, including those participating in the exchange program with the Royal Academy of Music, London. The event is free and open to the public, and parking will be available free of charge in Lot 95, accessible from 21st Avenue South. Those unable to attend the event will be able to access the recordings on the Fine Arts Gallery’s website and on mobile platforms such as smart phones and tablets within the exhibition. All images copyright 2016, Mark di Suvero/Spacetime C.C.